John James Durneen was the son of James and Margaret Eleanor Durneen. He was born about 1997 in Clogher. John James worked for Bullock & Co, a draper in Fintona, County Tyrone. He then moved on to work for Mulholland Bros., Cookstown. John enlisted in Antrim about July 1916. 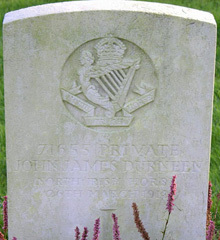 Private John James Durneen joined the 5th Army Cyclist Corps – the North Irish Horse – Regiment 'A' Squadron. Private John James Durneen was killed in action on Tuesday 26 March 1918 near Rubempre He was returning from special reconnaissance work and was instantly killed by a stray shell.